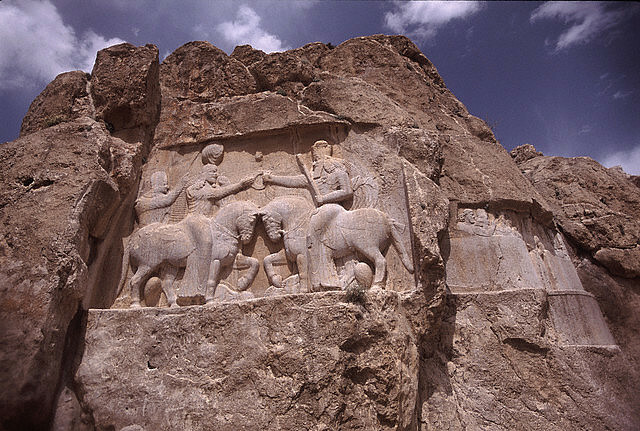 The oldest of the reliefs was mostly obliterated by work done later but is thought to date from around 1000 BCE. The faint image of a man can still be made out and it is thought that it is a remnant of the great civilisation of Elam – a major player in Middle Eastern power in the copper age. Yet the almost eradicated icon gives the place its name. With his unusual headgear still visible it is called the Picture of Rostam in English. 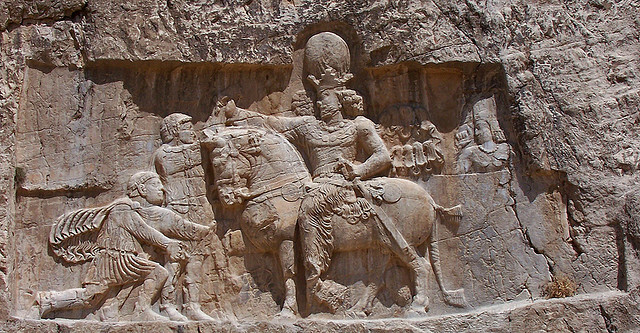 Rostam was a Persian champion of champions and it is the headgear which is reminiscent of later images of the hero that led the name to be given. High above the ground there are four crosses carved in to the sheer rock face. 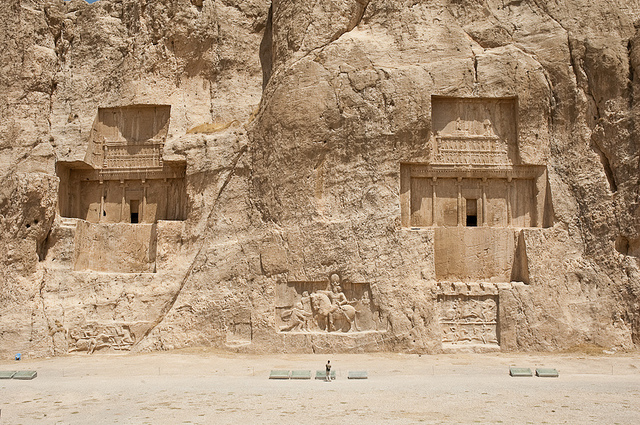 Known locally as the Persian Crosses, these are the tombs of Achaemenid monarchs. 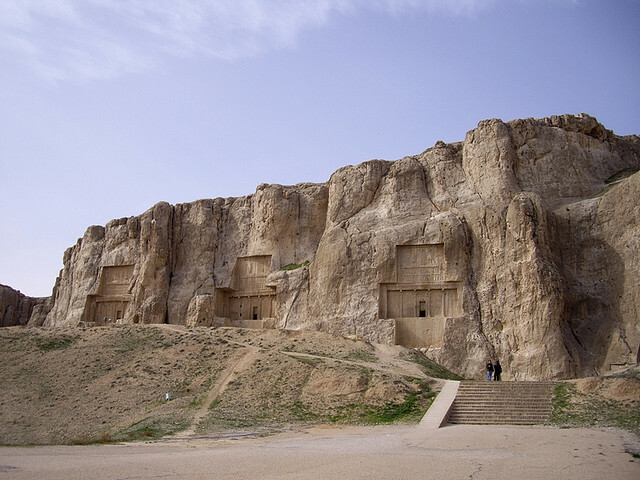 This realm, also known as the Persian Empire, persisted until the third century BCE and its rulers included names we still recognise today, such as Cyrus, Xerxes and Darius (all referred to as The Great). At the center of each of the crosses the entrance to each of the tombs is still visible. 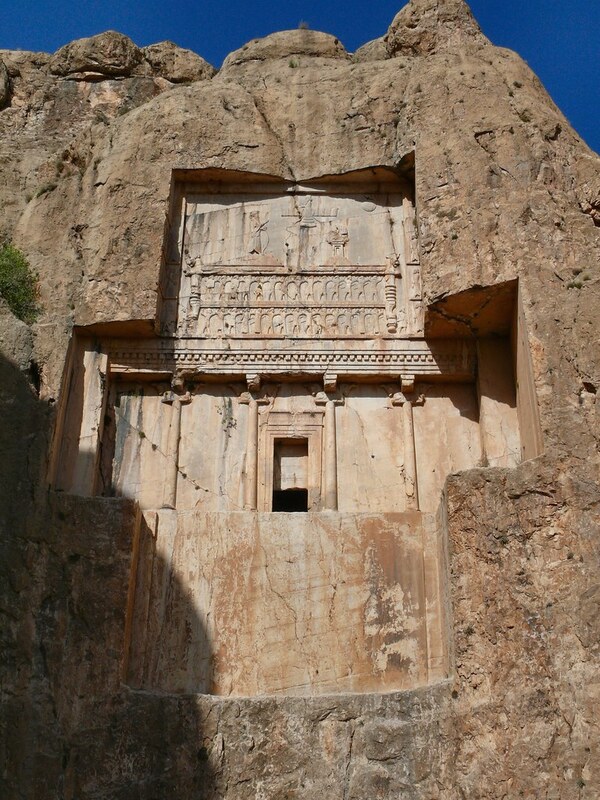 The entrance leads in to a small chamber in which the king would be laid in his sarcophagus. 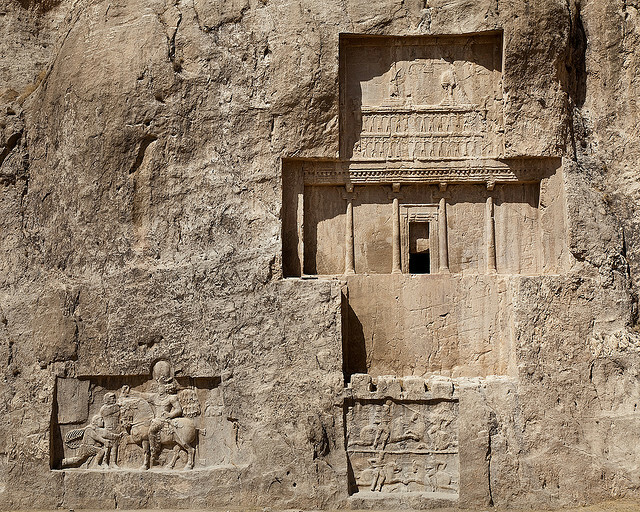 To indicate that it was a king’s tomb, the horizontal arch at the top of the relief is thought to be a reproduction of the one which lay above the entrance to the palace located in Persepolis. 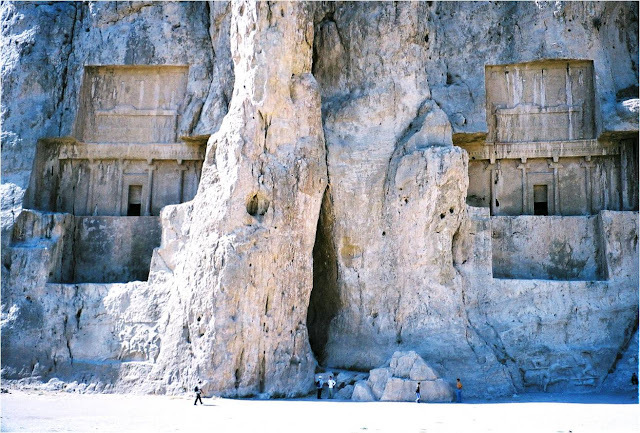 Yet the tombs are empty now – and have been for a considerable time. 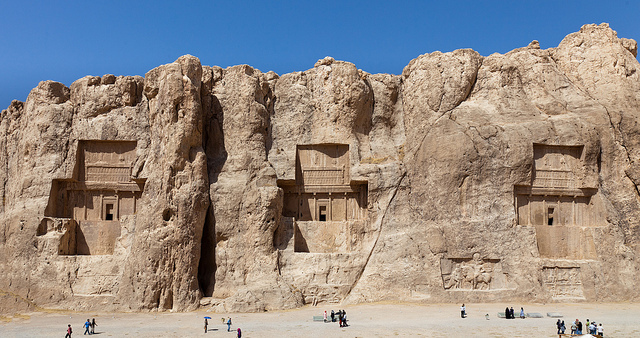 When the Persian Empire was defeated by Alexander the Great they were desecrated and their precious contents stolen. Perhaps they were too obvious a target to remain unspoiled for long. 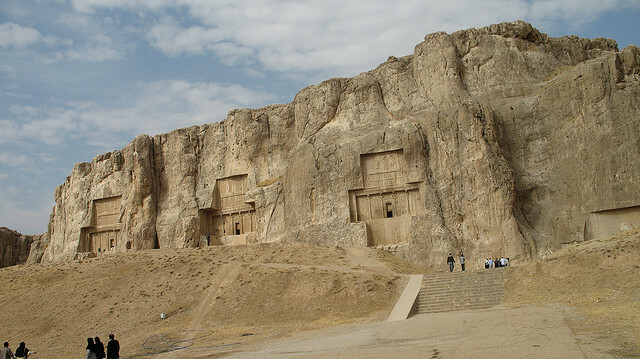 We only know for sure the identity of one of the kings who were entombed at Naqsh-i Rustam and that is Darius I who ruled from 522 – 486 BCE. The others are likely to be those of Artaxerxes I (r. 465 - 424 BC) and his son Xerxes I who reigned after his death until 404 BCE). 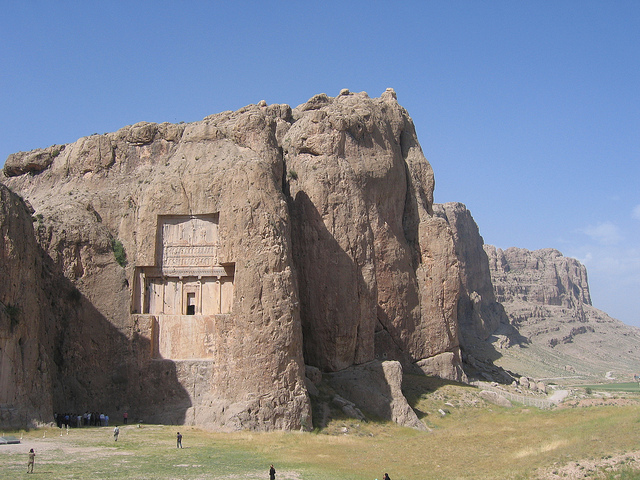 The other us thought to be of Darius III who ruled for six years from 336 – 330 BC. 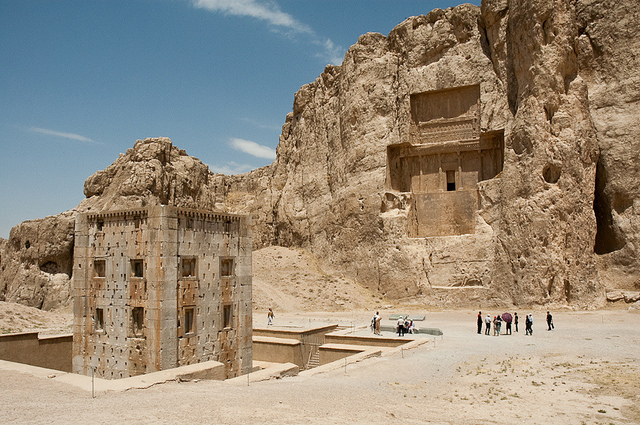 One of the oddest sights at Naqsh-i Rustam is the Ka'ba-ye Zartosht. 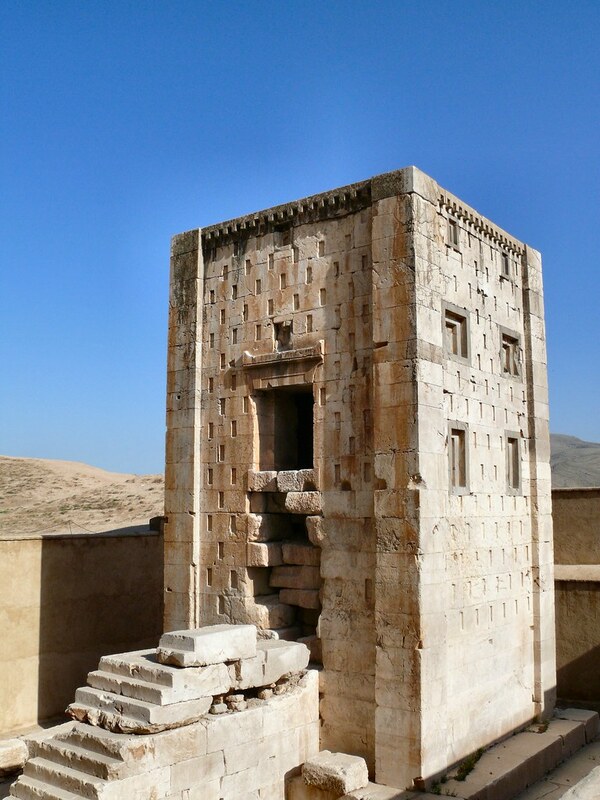 Looking to all intents and purposes as if a certain Star Trek: The Next Generation species had influenced copper age culture, the Cube of Zoroaster is a 5th century BCE tower-like edifice. Yet even though it is most certainly not a vestigial trace of a Borg incursion, no one is entirely sure what the building’s purpose was. 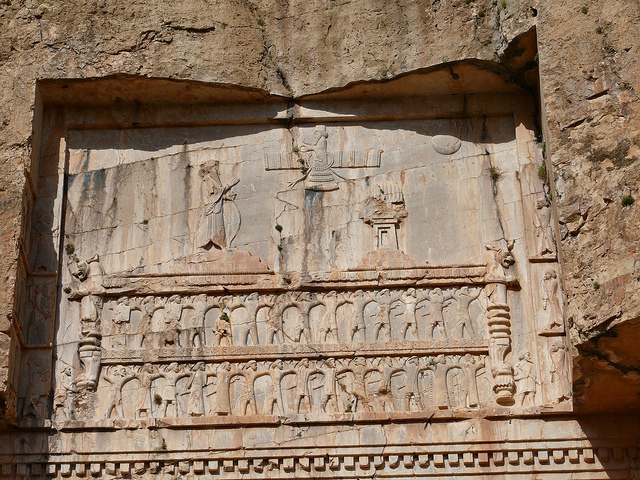 Some think it was a fire altar – a kind of eternal flame to the emperors of the Sassanid era. However, most seem to think it was another tomb or possible an enormous chest, to carry the paraphernalia of royal rule in to the next life. 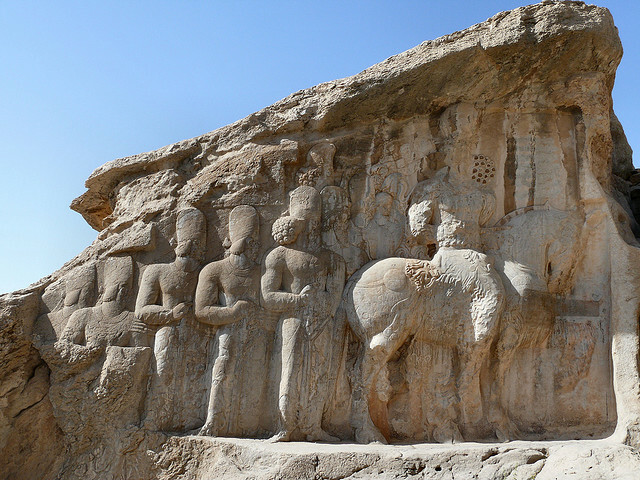 The supersized reliefs which surround the tombs are from a slightly later period, the last pre-Islamic Persian Empire, known as the Sassanid. We are not to expect depictions of ordinary people, of course – these are the monarchs of the period in all of their glory. 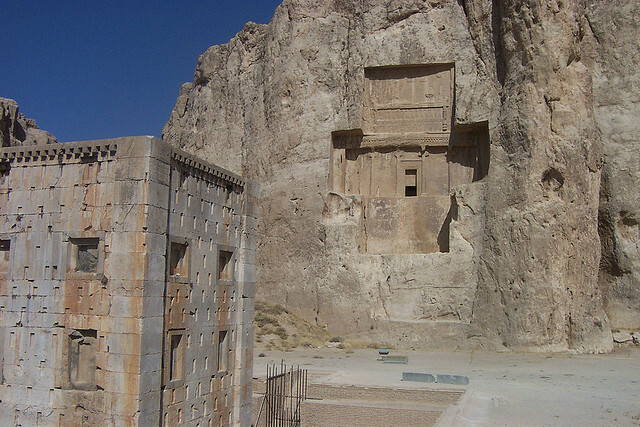 We can still clearly see the investiture of Ardashir I, who died in 242 CE. 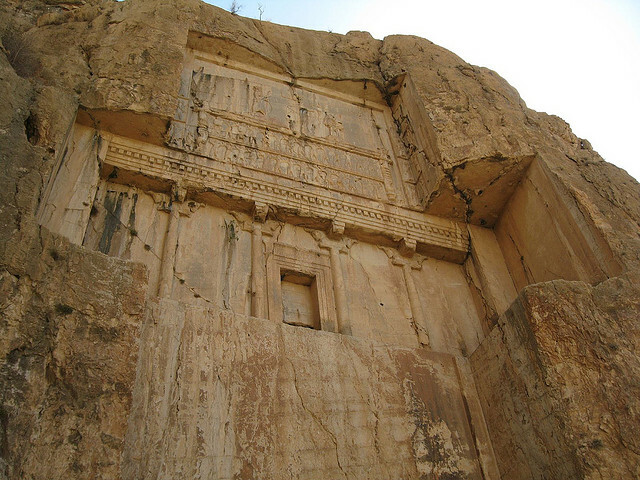 One of the reliefs features the oldest ever recorded inscription bearing the name Iran – 1800 years is a long time for a country to have the same name. We can also see the victory of the Sassanid Empire over their rivals, the Romans. 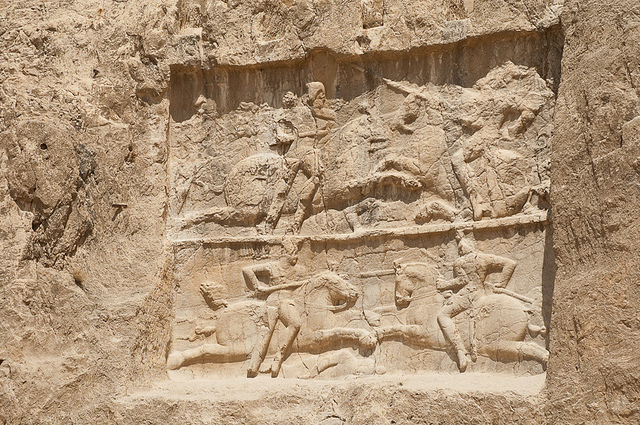 Above you can see the Roman emeror Valerian kneeling in obseqiously to King Shapur I. Both Valerian and Philip the Arab were Roman emperors who suffered defeat at the hands of the Sassanids. 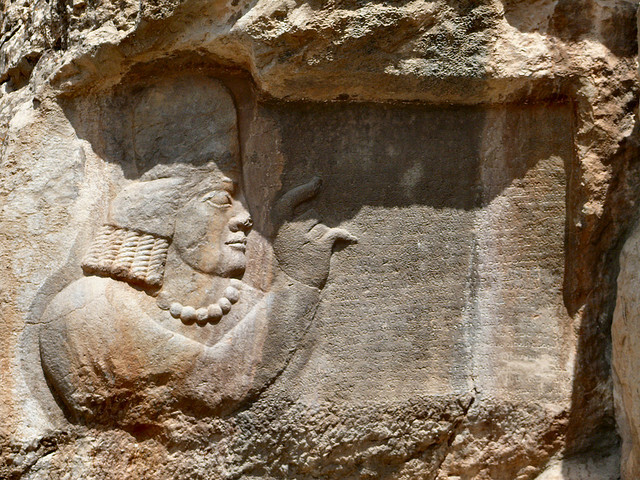 Another relief bears the inscription: A great god is Ahuramazda, who created this earth, who created yonder sky, who created man, who created happiness for man, who made Darius king, one king of many, one lord of many. Change the name of the god and of the king and we can see that although times have changed humanity has held on to certain ideas for millennia. There are other rock installations at the site which are still to be unearthed, buried as they are under several meters – the detritus of millennia. 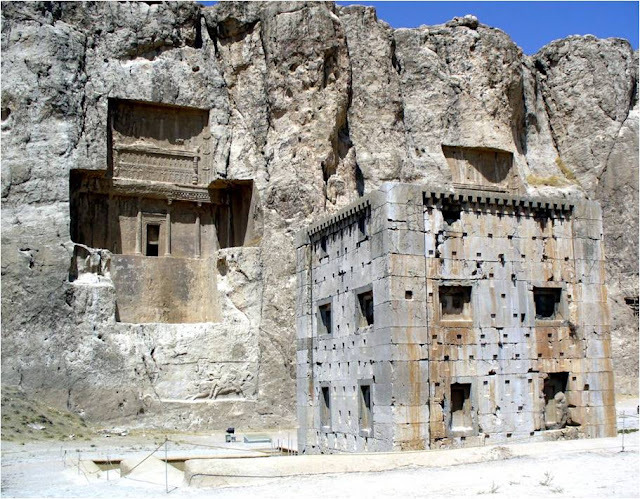 Who knows what treasures wait to be discovered at Naqsh-i Rustam?